KoopaTV: We're Looking Forward to ACES and ATTORNEYS This E3 2018! We're Looking Forward to ACES and ATTORNEYS This E3 2018! By LUDWIG VON KOOPA - Aces Attorneys. You should not ignore the fact that Mario Tennis Aces will play a decent-sized role in E3 2018 this year, with it featuring in the Nintendo New York store's plans. We loved the demo for Mario Tennis Aces and very much look forward to its release later this month. Since Nintendo went out and said that Mario Tennis Aces is key to the Nintendo Switch's success in the fiscal year between March 2018 and March 2019, then they'll want to promote it a lot at the biggest gaming event of the year. You know which company's executives also mentioned a series we're excited for, that has a game releasing on the Nintendo Switch in that same fiscal year time period? CAPCOM. The game series? Ace Attorney. Whatever Ace Attorney presence that is coming soon hasn't officially been announced yet. E3 2018 is the perfect time to do that. So. E3 2018. Tennis Aces and Ace Attorney. We may even get representatives from both in “Super Smash Bros. game for the Nintendo Switch system” with playable Waluigi and any representation of Phoenix Wright. I will now have the rest of this article comparing Mario Tennis Aces and the Ace Attorney series. Get ready for some puns! And similarities. Looks like they're all playing Wii Tennis. First, in both the tennis court and the court of law, there is only so much faulty activity they're willing to tolerate. In tennis, it's two faults. In Ace Attorney, it's five faults (penalties). There is a lot of serving that happens. You can serve a ball, or you can have justice be served, instead. An Ace Attorney and an Ace Tennis player both have a variety of tactics they can employ. 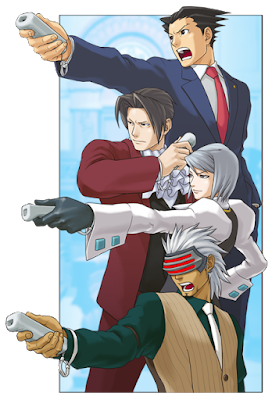 HOLD IT!, OBJECTION!, and TAKE THAT! for one, and top spins, slices, and flats for another. The Zone Time and Zone Shot techniques are basically the same as Apollo Justice's Perceive and GOTCHA! Meanwhile, a skilled Ace knows when to focus and use their Special Shot, or their Revisualization. We know both tennis and being a lawyer involve a ton of sweat. 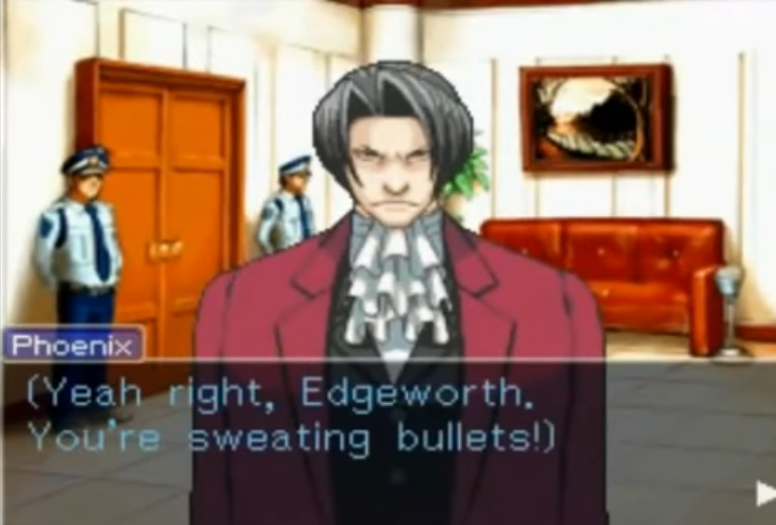 Phoenix Wright gets in frequent cold sweats! As do other people. Miles Edgeworth dislikes sweating bullets, so he flees to Europe where they ban them. Both courts have two sides, an offense and a defence. They're mediated by a referee, or a judge, whom may be persuaded by enough arguing to change their decisions. In fact, the whole concept of a turnabout exists for both tennis and being an attorney. When you're behind, you have to come back. That's the break point! We have more evidence and rallies to point out with an outstretched pointer finger, but we've reached our own break point and got to end this article. Do you have a different view than KoopaTV of what your most anticipated games of E3 2018 are? ...Do they go really well together like Mario Tennis Aces and Ace Attorney? Stay tuned for the official KoopaTV E3 Weeks 2018 Schedule, to be released on Friday! On the other hand, the pre-E3 article for E3 2015 was very upset that there would be no Ace Attorney announcement and wasn't hopeful that a lack of an announcement meant it would actually come. Here is the E3 Weeks 2018 Schedule. Did KoopaTV's expectations go anywhere useful? That can only happen if there won't be any other games Janet will have to localise, and I doubt that CAPCOM exec would be talking about an American localisation! My most anticipated E3 announcement is Spyro: Reignited Trilogy for the Switch. Spyro was what solidified me being fully into video games so I would like to give thanks for it by getting its remake as well. Before Spyro I was mostly casual playing NES and SNES games here and there. I am even willing to get a PS4 for it if no Switch version is planned. Get a PS4 just for a trilogy of remasters just to say thank you? That's pretty committed!